Northern Exposure Spain, a boutique provider of custom tours in Northern Spain, now offers Spanish language learning to complement its unique tours of the Cantabria area of Green Spain. I traveled to Spain specifically to study Spanish intensively. Northern Exposure Spain put together a fabulous week for me in Spain, which surpassed all of my expectations. Northern Exposure Spain now works closely with several language academies to offer clients options for learning Spanish while touring Northern Spain. Both group and private instruction are now available for those wishing to learn Spanish as a part of their travel experience. Northern Exposure Spain complements formal language instruction with cultural immersion while touring this lesser known, off beat region of Green Spain. 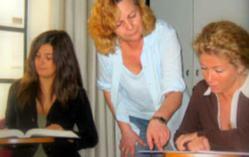 “Our clients often ask us for help with their Spanish. As a native speaker, conversing with willing clients has always been enjoyable for me while offering a richer travel experience for those wanting to learn the language. Adding the opportunity for formal instruction to our clients was a natural progression for us. Now clients can take classes at one of the local academies we work with, providing a solid base for the practical experience they get while touring Cantabria with us, ” stated Charles Schwalbe Garcia-Lago, Chief Experience Officer at Northern Exposure Spain and a native of Cantabria. From a week of private instruction at a language academy, to month long courses at one of the higher learning centers in the region, Northern Exposure Spain clients now have various options available for learning Spanish. Classes are arranged to fit client travel schedules and language skills accordingly. Clients get practical experience using their Spanish while learning about unique historical sites, attending local cultural events, developing an understanding of the varied cuisine, and interacting with locals, including Northern Exposure Spain owner, guide and CEO, Charles Schwalbe. “While we specialize in providing custom, carefree travel experiences in Northern Spain, some clients, such as the Rev. Zabriskie, prefer to enrich their travel experience by challenging themselves to learn Spanish. English is not widely spoken here, providing a wonderful opportunity for those interested in learning or perfecting their Spanish. Formal classes coupled with practical experience create a perfect avenue for our clients to do this,” emphasized Northern Exposure Spain CEO, Charles Schwalbe. Travelers interested in finding out more can inquire here about learning Spanish on a Northern Exposure Spain custom tour in Northern Spain or contact Charles Schwalbe directly at 888-737-8146. Northern Exposure Spain provides unique, custom tours in Northern Spain. Based in Cantabria, at the heart of Green Spain, the company tailors tours to client preferences and interests, highlighting the history, cuisine, culture and natural beauty of this lesser known but surprisingly rewarding area of Spain.